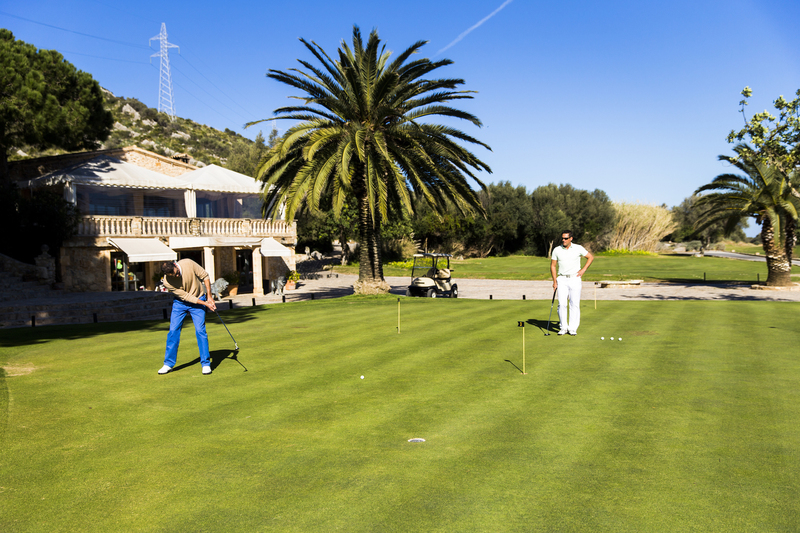 This golf-tuition course is ideal for golf players with handicap or “Platzreife”. 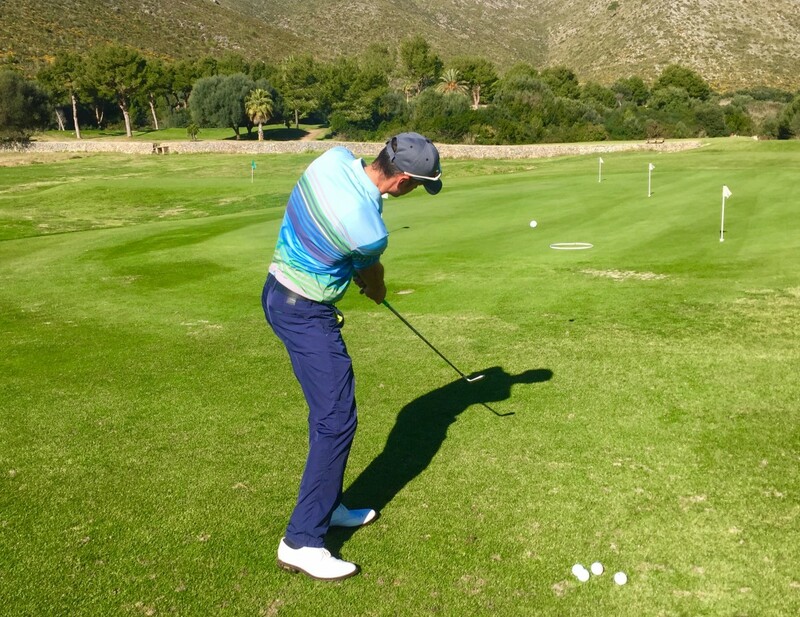 We train 5 days a week, 3 hours daily in a healthy mix between Driving-Range and playing lessons on the course. As we have very small groups, we can adapt to our pupils in the necessary manner so that all topics can be worked on during the week. We would normally start the golf-tuition with a 45- mins short game session. May that be putting, chipping, pitching, sand play, semi-rough play around the green. We (can) vary this every day or repeat trouble shots. Each session consists of a variety of mini-power-learning sessions and with break-ups. We also add games and tests. Learning is so much fun! We then move into a long game session, in which we work on all kinds of topics. Find out more below in the detailed section. We finish with a few holes on the golf course, where different topics may be targeted. We vary the game format: from playing under pressure with score to experimenting or practicing. Quite often we find ourselves training on the course itself. 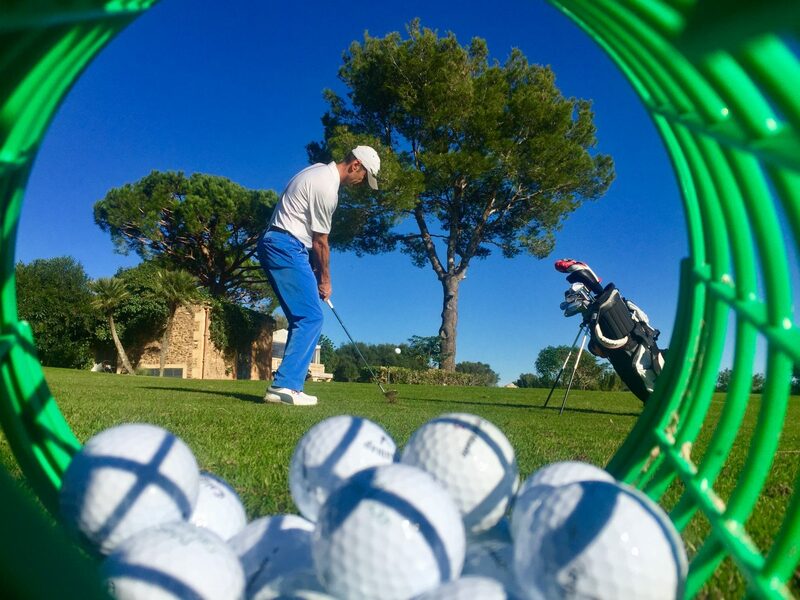 Instead of short game work on the range, we simply go out on the course and practice different shot types there. It’s all possible and a great learning experience you should not miss out. 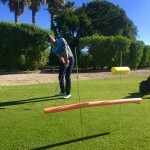 Related link: Find out how our practice facilities help you with the learning. A course goal of yours can be: become more consistent, improve short or long game, get rid of typical miss-hit or become more skilled in playing on the course. 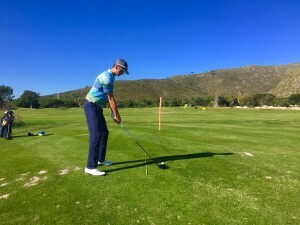 According to those goals that you bring to us, we structure the practice so that we can for instance build-up abilities and increase skills to become more consistent, make one or two adaptations to your short game technique, find cause & effect for your miss-hit and set up a practice routine so you understand what it takes to improve it. We also assess your playing strategies and generally a few simple tips will make a difference of a few strokes in the end of the round. Lets dive into the typical week in more details, so you can get a better grasp on what will be going on and decide if this suits your needs. When we meet, we first check your clubs. We get a good view of what golfer is in front of us by just seeing the clubs. If someone needs any additional clubs, we can provide quality material, which can even be bought in the end of the week – should they make a difference. Another problem solved: finally you have a hybrid club that helps you getting through the semi-rough on your home course. On the short walk to the range, we get to know your goals and motivations, we will ask you about your physical limitations and show you our training facilities. It’s all in a 9 iron distance. Short game training is usually first. It is pretty straight forward. See where you are with your game, then either help with technical advice should you have typical mis-shots or starting games to improve your skills should you be a good short game player. Training sessions are usually kept short and different shots are mixed to challenge the golfers ability. We help establishing trust with the corrections. 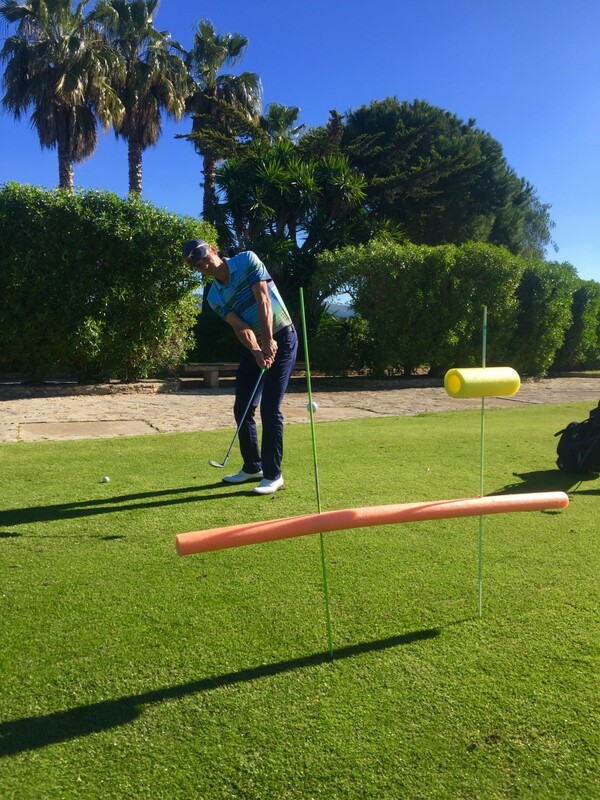 But we manipulate the exercises and add either difficulty, change shot types or use pool noodles and ropes to not really give the golfer any other option than the right shot. After all, we are in the Learning Business, and easy practice only helps the ego, not the skills. 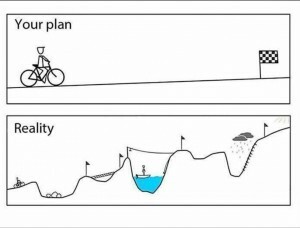 But don’t worry if this sounds all strange, learning is a bit chaotic, it does not happen in a straight line. That’s why for us it is so much fun to teach you. Everyone is different, and we adapt. In some moments you need help and trust, in others you need a healthy challenge. Short game training is actually the easiest way to cut strokes off your handicap, so we tend to give the short game good attention and in the end of the week results are always visible. If you are reading this, you are a motivated, sensitive and interested golfer. You are somebody that is not standing still, but wants to improve. That is awesome! To help you grow, we use modern approaches to learning. It won’t be like: “Let’s hit the bucket of balls with your 7 iron.” It’s so much more than that, promised. Building an optimal learning environment where open results are encouraged and emotions are held in a learning-friendly way. 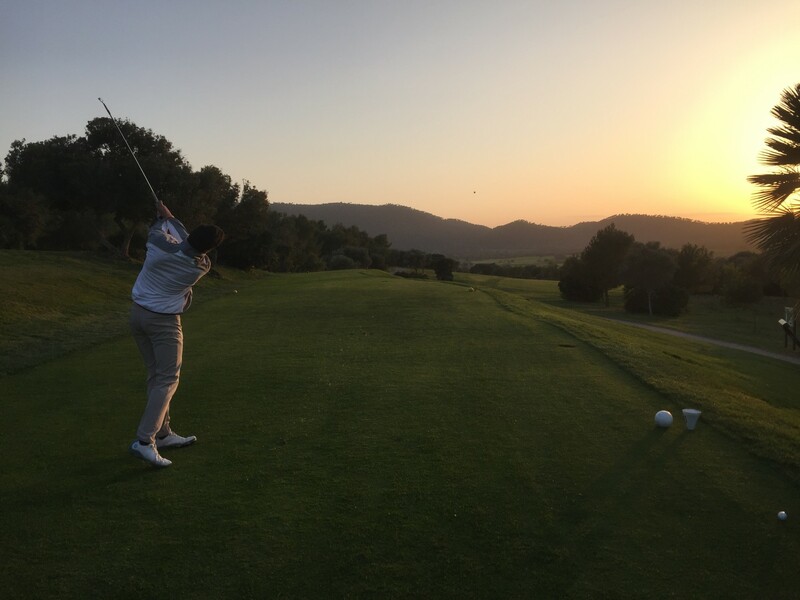 Golf is not so much a game of “must do’s” as described in the teacher’s manual, as it is a game of adjustments and choices gained, lots of times, through self-discovery and self-assessment, which we will try to boost and make you see. Long game training is so much fun, especially for us coaches. It is of course about finding weak technical spots that make a shot unworkable or at least inconsistent. In those years of teaching, a teacher hopefully finds that there are many ways to Rome. There are more “you can’s” than “you must do”. 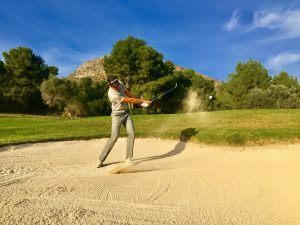 In a nutshell: the swing technique should provide your body with a movement that it can repeat in a desired manner to a certain precision and with a certain speed. Your technique should be easy to coordinate for your body and deliver the desired impact positions. 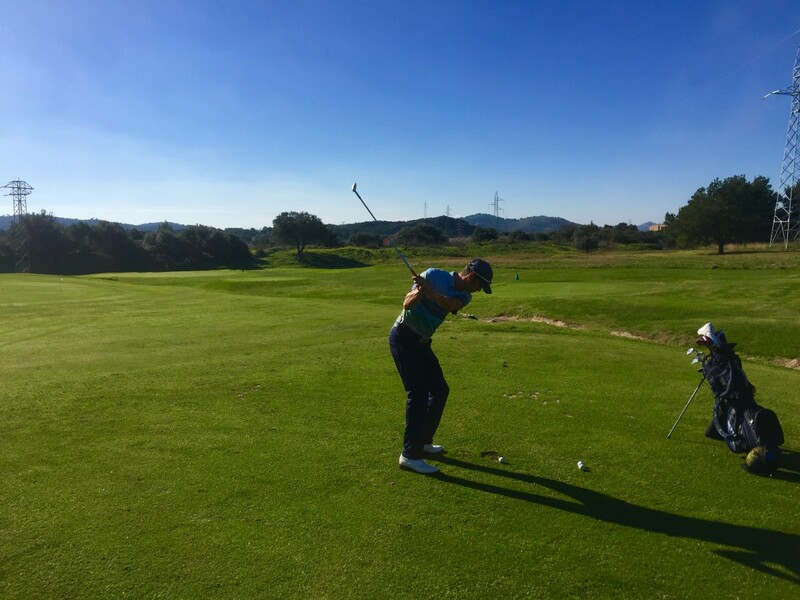 If your swing is having one or two pieces that make it so very hard for your internal coordination to deliver the club, a Golf Teaching Professional will want to implement a simpler and more effective piece for your body. I have stopped to only check for picture perfect positions in a golfers swing, I look for abilities a golfer can produce. Parts that acutally work together. A golfer is depending obviously on how his body can move. During the lessons we do functional movement screen excersises, which help us establish your can do and can’t do. Of course we help with changes, and yes there is a procedure we use to make changes effectively. But after all it is about making sure the movement can deliver when it matters. And if it can, now the fun becomes even bigger. Now it is time to make it harder and get your system (your inner coordination) to work overtime to achieve what we call “superman abilities”. This is when a teacher changes to a coach. A coach provides help with self-esteem vs. level of difficulty, with understanding what is happening in a learning process. In guiding the golfer to get to the next level. Every golfer has an inner voice and inner control center. We try to stimulate improvements with carefully chosen exercises that stress the inner coordination to a level it actually has to come up with a more precise solution. That’s when learning takes place. What’s 3 + 3? 6, ok and what’s 3 + 3? 6. ok. And what’s 3 + 3? 6. ok well done! Now: what’s 12 x 5? …. And what’s 18 : 5? … And whats 23 – 7? On which example did you actually have to do some calculation? Which example was harder to do? On which example will you actually become better at maths? Which example is great for your self-esteem but poor in actual learning? We will introduce stress to the system to actually make it grow. Always recognizing that we now leave the safe environment and go into turbulent waters – looking for that treasure. That is where we can see the best learning happening. The sessions will be very short and humor will keep frustration away. But learning is king and we must do what it takes to become more skillful. 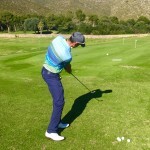 Be it working on your Driver, solving the problems with hitting the ball first and then the ground or encounter difficulties with a centered strike in the middle of the club face… we see where you are, either you get technical advice on how to improve mechanically, or we switch into skill acquisition mode where the fun is endless and learning and becoming better is maximised. One big piece of our instructional content is “Learning How To Practice”. So each session features a series of Guided Practice Exercises. If the golf course does one thing, then it is this: separating shots from each other time-wise as well as continuously changing shot types (Chips, Putts, Driver, Iron, Sandplay) in different lies. So if the course will test us for this, we might as well practice what we will be tested on, no? So playing games and doing manipulated exercises are huge in this. Stanford University research shows, that “the main reason you can’t move the same way each and every time, such as swinging the golf club, is that your brain can’t plan the swing the same way each time.” (Krishna Shenoy, Assistant Professor, whose research includes study of the neural basis of sensorimotor integration and movement control). So if the brain won’t allow us to ‘code’ the swing perfectly, we all will have to deal with a certain level of inconsistency. People seem to be be improvisers by default. Researchers speculate that the brain has evolved its apparently improvisational style precisely because the vast majority of situations require significant movement adaptations. So we have chosen to enhance our practice with games that will take care of this adaptational necessity. And they are so much fun – and you will get a tan on top. Oh yes, on course teaching is our favorite. We have given detailed information above how the learning process happens, but when on the course, it is actual playing time. Now the focus changes. We actually try to hit a ball to a certain spot. We are not so much focused how to do it, but where the ball has to go. This is why the understanding of what the brain does and why it is important to train in a certain way (which we do), becomes important. So we can work on shot results, we can use the course to give us the typical situations we encounter. We improve etiquette and rules knowledge. On the course, the golfer has typically a bunch of questions that come from the “what shot should I play here best” corner. Or they can’t believe that ball always goes right. It seems to be like Disney magic, leaving you with an open mouth each time. Don’t worry, we got solutions for all of that. 20 years of teaching, we have seen, solved and a plan for it all. Modern technology can be very helpful, especially when it comes to make more educated analyses. Having a radar at hand or a pressure mat when you see somebody having issues with a centered strike, makes a teacher’s life so much more simple. Related link: Find out more about our technology we use. So that’s what we do everyday. Work on your game, the way you can do it best. Enjoy the sun and have fun. Welcome to our advanced course during your holidays in Majorca.